The Ford F-150 full-size pickup truck is a long-running American icon. It challenges rivals from across town: the Ram 1500 and Chevrolet Silverado or GMC Sierra. As popular with fleet buyers looking to get the best bang for their buck from a rugged truck and those who want something flashy that won’t look at out of place driving up to, say, the tony Ritz-Carlton in Dallas, the F-150 has one of the broadest buyer bases imaginable. Refreshed for 2018, the Ford F-150 sees some big improvements over its predecessor. 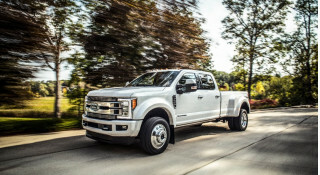 Ford made its best-selling truck look a little neater inside and out, it revamped the pickup’s engine room with new gas and, for the first time, diesel engines, and it brought a bunch of big safety upgrades to the table. The most recent addition to the F-150 lineup is a new 3.0-liter turbodiesel V-6 engine. 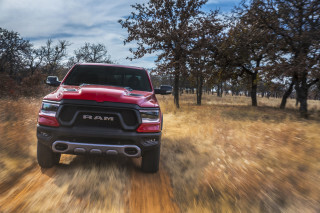 Some versions of the truck equipped with that engine return 30 mpg on the EPA cycle, which helps the F-150 as Ram prepares its mild-hybrid and future fuel-saving models. But Ford hardly ignored the truck’s gas engine lineup. A new 3.3-liter V-6 replaces last year’s 3.5-liter as the truck’s base engine. Its 282 horsepower and 253 pound-feet of torque, but the new engine makes use of direct injection that should reduce fuel consumption. Next up is a new 2.7-liter twin-turbo V-6 that Ford says will be both more powerful and less thirsty than before. The automaker also revised the optional 5.0-liter V-8, which although declining in popularity against the boosted V-6s has been a solid choice for many buyers (a 3.5-liter twin-turbo V-6 is largely carried over into 2018). Since 2018, all of those engines except the base V-6 are mated to a new 10-speed automatic transmission co-developed with General Motors. Rivalries only go so far, it turns out. With the F-150, Ford has adopted fresher looks inside and out for 2018, with new front and rear end styling and detailing plus a choice of 6 revised wheel designs in diameters ranging from 17 to a hefty 22 inches. The truck’s interior has some new colors and some switchgear has been revised. A high-end B&O Play audio system has been added to the options list. 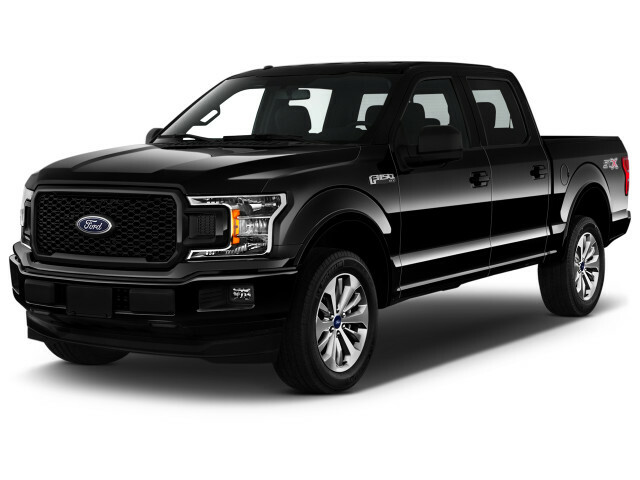 Depending on the trim level, the F-150 will now be available with automatic emergency braking with pedestrian detection and adaptive cruise control that can bring the truck to a stop in traffic and then start up once the vehicle ahead begins to move. For 2019, Ford added more power to F-150 Limited trucks, and made other minor option changes. Although Ford had previously built passenger-car-based trucks, the company sold its first true full-size pickups in 1948. Throughout much of the next decades its F-Series pickup trucks came with 6- or 8-cylinder engines; 3-, 4- and 5-speed manual transmissions; and a single two-door body style. By 1960, the "F-100" had been christened at the entry level, with F-250 and F-350 versions available with an early kind of four-wheel drive. As most trucks of the era were designed as "flareside" models, Ford added a plain-sided Styleside version that would dominate sales from then on. For the fourth-generation F-100, Ford added a "Ranger" trim level and briefly built some trucks with unibody construction, returning to body-on-frame designs in the mid-1960s. Four-door models were offered, as were versions that adopted camper tops easily. A fifth generation arrived in 1967, with plainer sheet metal but the essential truck features intact: V-8 or inline-6, two- and four-door body styles, and payload capacity into heavy-duty territory. 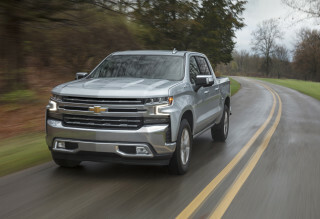 The sixth-generation truck is known primarily for adding the 302 V-8 to the lineup, spawning a new two-door Bronco SUV, and bringing the F-150 badge to the lineup; the latter was a higher-payload version of the existing F-100. The F-150 grew more upright and more capable in the next three generations of trucks sold from 1980 to 1996. Diesel engines and new automatic transmissions joined the lineup, and the Ranger name was split into its own compact-pickup truck lineup. An "Explorer" trim level joined the F-150 lineup and would be spun off into its own SUV range in the same decade. In the eighth-generation truck that arrived in 1987, fuel injection became the norm, and flareside bodies went away for a time; rear anti-lock brakes were standard, for the first time on a full-size pickup truck. The ninth-generation truck went on sale in 1992 and brought with it a driver-side airbag and slightly smoother styling. The 10th-generation F-150, sold from 1997 to 2004, marked a sea change in pickup trucks. Ever more the choice of commuters and daily drivers, the F-150 grew far more shapely and rounded in this generation—mimicking the lines of some of Ford's passenger cars. The old, squared-off truck was continued for a while, until Ford could tell if pickup-truck drivers would approve of the new looks. They did: The F-Series retained its best-selling title and grew even more popular. New engines came with the new body style, including versions of the Ford "modular" 4.6-liter and 5.4-liter V-8 that would prove very durable. The usual two- and four-door and extended-cab versions were available, as were four-wheel drive and a 4-speed automatic, along with heavy-duty F-250 versions. Special editions introduced in this generation included the SVT Lightning, the Harley-Davidson F-150, and the King Ranch edition. Safety ratings were poor, though, and while this F-150 had good reliability, its cruise-control system was involved in a major recall for the potential of causing a fire. This F-150 spawned a short-lived Lincoln Blackwood version, along with the longer-living Ford Expedition and Lincoln Navigator SUVs. The 11th-generation F-150 arrived in 2004 and began to revert the truck's shape to its more angular past. A more upright grille, and more squared-off window openings were the hallmarks of the design. While it didn't change much mechanically, it did introduce standard curtain airbags and stability control to the full-size pickup range at Ford. The company put special attention into reducing the truck's cost and complexity, making it easier to build—and even more reliable. By some measures, it was considered the most reliable pickup truck ever built. Ford attempted another Lincoln pickup from this generation—the Lincoln Mark LT, which like the Blackwood before it, was a sales flop. The 12th generation of the Ford F-150 arrived in 2009, with its sheet metal even more crisply folded than earlier models—bearing many cues of a Ford F-350 Tonka concept truck from the late 2000s. The 12th-generation F-150 wore a very large, very bright, very tall grille to emphasize its "truck"-ness. It's somewhat redundant, since the F-150 was one of the most capable towing and hauling light-duty trucks available in America. In 2011, the F-150 received its most comprehensive powertrain update. To go with its cutting-edge technology—including Bluetooth, SYNC voice control, even ventilated front seats—the F-150 gained four new engines, all teamed with a 6-speed automatic transmission. A 302-horsepower V-6 rejoined the lineup for the first time in more than a decade, and delivers the F-150's best gas mileage, at 17/23 mpg; turbocharging a version of the engine created the EcoBoost, with 365 horsepower and a towing capacity of 11,300 pounds. A 5.0-liter V-8 with 360 hp brought Mustang-style engine noises to the full-size truck, along with 15/21-mpg fuel economy. Finally, there was a 6.2-liter V-8, with 411 hp and 13/18 mpg fuel economy, offered in the most upscale F-150s as well as the off-road Raptor. For the 2012 model year, Ford added a new automatic all-wheel-drive mode to some 4x4 F-150s, and swapped out limited-slip differentials for an electronically simulated limited-slip function. Then on the 2013 Ford F-150, the automaker added MyFord Touch's suite of voice, steering-wheel, and LCD touchscreen controls to the pickup, with other minor changes to the front end, including high-intensity discharge headlights to some models. The King Ranch model returned as well, with a new black interior choice and standard MyFord Touch, for a base price of more than $44,000. In this generation, the F-150 came in a host of cab, bed, powertrain, and suspension variations. Three cab configurations with multiple wheelbases and box lengths each were offered, providing choices to satisfy just about any trucker's need with the F-150. Properly outfitted, this F-150 could tow 11,300 pounds—while earning top crash-test scores (including IIHS Top Safety Pick status and a "Good" rating in the roof-strength test). Unlike GM's pickups, there was no Hybrid edition, and the F-150 fell behind the Ram's excellent ride quality. However, this F-150 had a well-built cabin, excellent shift quality and comfortable seats—as well as the off-road-ready Raptor model and some of the most up-to-date luxury features found on any truck. Over the years, the F-150 has been mechanically related to the Ford Expedition and Lincoln Navigator, though those SUVs now only share powertrains with the trucks. It may not have looked all that different from the outgoing F-150, but in 2015 Ford updated its truck with an aluminum body designed to save weight—and thus increase fuel economy. It was one of the boldest moves ever made in the pickup segment. In many ways, the 2018 is a major update of the 2015. Inside, the look was not a great departure from previous versions of the pickup, though there was a new level of upscale design and nicer materials on premium trims. Blocky shapes and sturdy structures were the visual theme to back the F-150’s chosen mission. Ford also added a long list of standard and optional features, including massaging seats, a surround-view camera system, and several nifty in-bed storage solutions. Engines were another area of innovation for the F-150. Four engines were available from the start, and while three were familiar, the new 2.7-liter EcoBoost V-6 was an unusual choice; Ford saw it as the go-to for gas mileage in the new F-150. Also available was an updated 3.5-liter V-6 engine, which replaced the outgoing truck's 3.7-liter, as well as the familiar 3.5-liter EcoBoost V-6 and 5.0-liter V-8. The F-150’s front suspension is a coil-on-shock independent arrangement, while the rear retains the Hotchkiss-type solid axle riding on leaf springs and outboard shock absorbers. The rear suspension got a significant rework, however, with a switch to staggered shock placement among other changes. Improved electric-assist power steering and four-wheel-vented ABS disc brakes round out the key mechanical specs. Ford used the 2015 Detroit auto show to announce a new Raptor based on the aluminum F-150. The new super-truck, which arrived in the 2017 model year, featured an upgraded suspension, a new four-wheel-drive system, and a high-output Ford Performance 3.5-liter EcoBoost V-6 that makes more power and torque than the outgoing 6.2-liter V-8 engine. Ford says the second-generation truck weighs 500 pounds less than the previous Raptor, as well. Ford also announced that the F-150 is be available with natural-gas and propane fuel options. Beginning with the 2016 model year, the F-150 equipped with the 5.0-liter V-8 is available with a gaseous-fuel prep package. Vehicle upfitters will then be able to install the necessary tanks and other hardware to convert the truck after sale. For 2017, Ford outfitted its top-end F-150 models with a next-generation version of its 3.5-liter EcoBoost engine, which added 10 hp and 50 lb-ft of torque. It paired the new engine with a new transmission too: a 10-speed automatic jointly developed with General Motors. I would have killed for this vehicle when I was young, I'm not and it's too damn big and unwieldy!